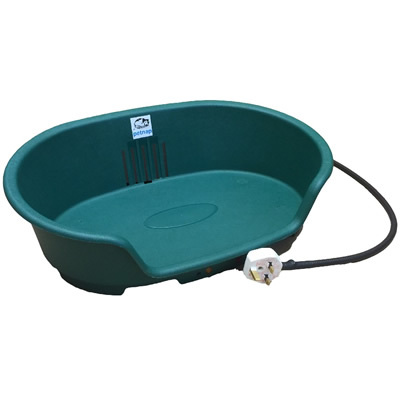 Thermostatically Controlled Beds provide the ultimate in animal heating. The thermostat keeps the bed at a constant temperature to maintain the blood temperature of a cat or dog. The 1.5 metre cable is covered with an earthed plastic coated metal cover and a plug suitable for use in the UK. All beds are manufactured to CE standards and come with a 2 year parts and labour warranty, and will give many years of excellent service. Note: ALL PRODUCTS ARE FOR 220/240 VOLT OPERATION ONLY. Dimensions in inches: Overall dimensions 21" x 15" x 6.5". Length of Oval Base: 18"
Dimensions in inches: Overall dimensions 25" x 17" x 7.5". Length of Oval Base: 22"
Dimensions in inches: Overall dimensions 39" x 27" x 12". Length of Oval Base: 34"